When you come across a difficult question, how do you deal with it? We have classified thinking strategies into five patterns. To solve GMC questions quickly, you need to pick the right strategy or combine some different strategies efficiently. Which approach should you use for each question? Firstly, let’s look at the characteristics of the five strategies. When you employ the ‘Step’ strategy, you do not easily trust your ‘feelings’ or ‘instincts’. You work your way through the question step by step, based purely on what you know to be true. It always requires you to have a solid reason to move on. 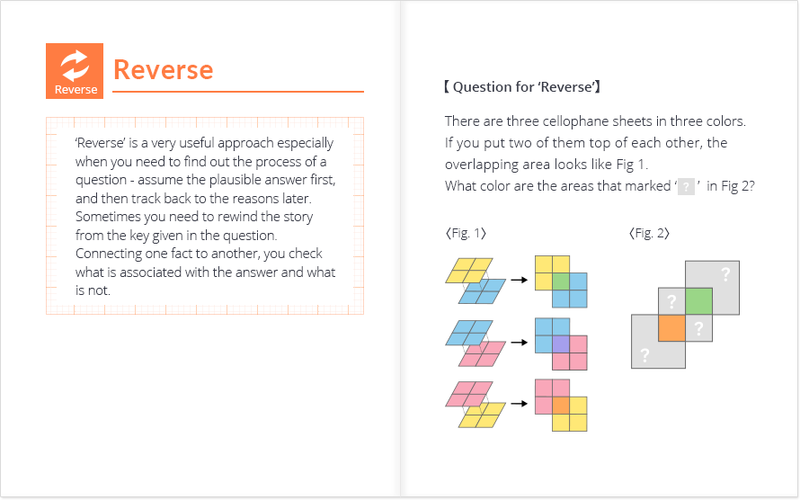 ‘Reverse’ is a very useful approach especially when you need to find out the process of a question - assume the plausible answer first, and then track back to the reasons later. Sometimes you need to rewind the story from a hint given in the question. Connecting one fact to another, you check what is associated with the answer and what is not. 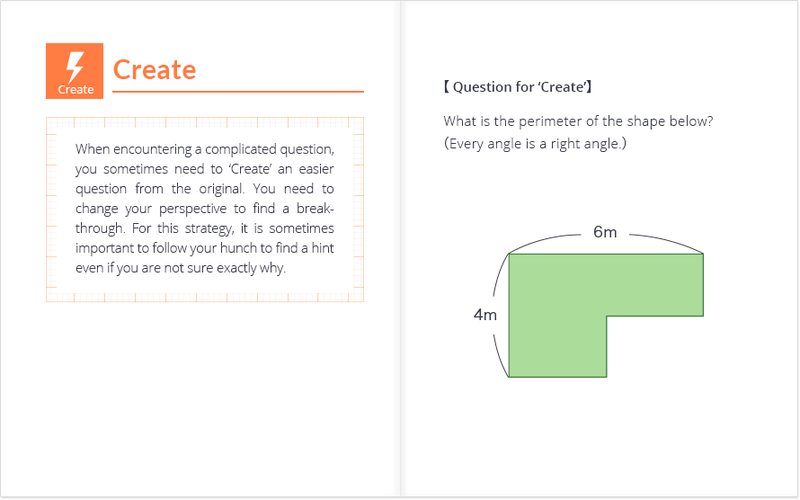 When encountering a complicated question, you sometimes need to ‘Create’ an easier question from the original. You need to change your perspective to find a breakthrough. For this strategy, it is sometimes important to follow a hunch to find a hint even if you are not sure exactly why. 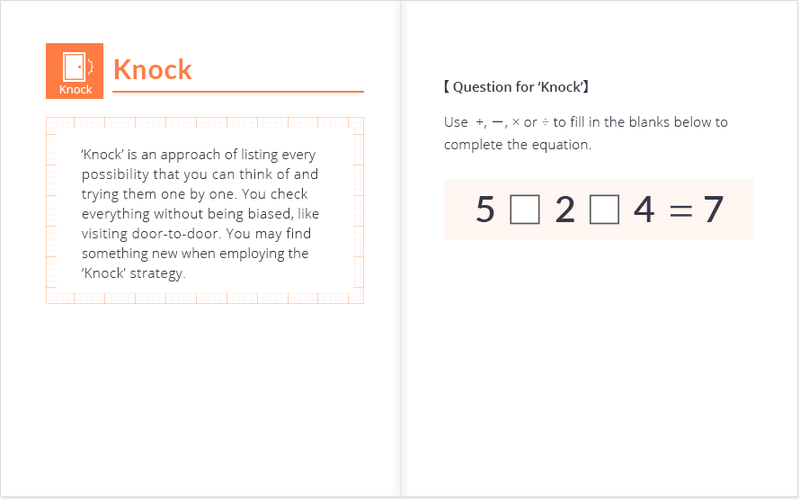 ‘Knock’ is an approach of listing every possibility that you can think of and trying them one by one. You check everything without being biased, like visiting door-to-door. You may find something new when employing the ‘Knock’ strategy. 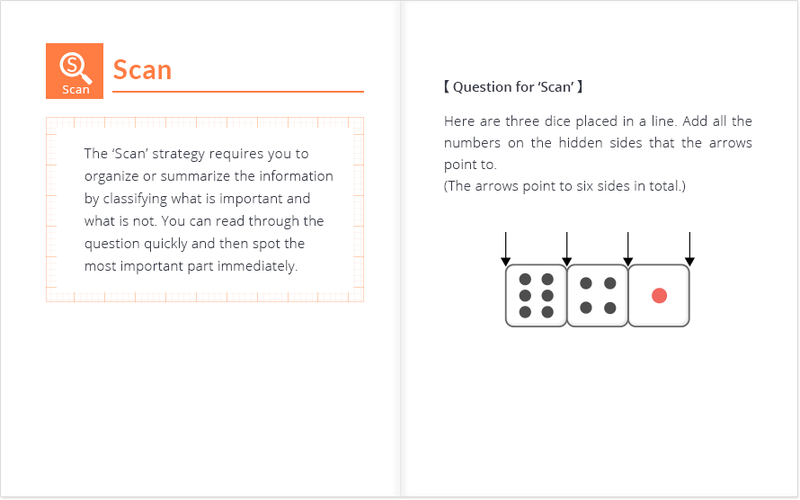 The ‘Scan’ strategy requires you to organize or summarize information by classifying what isimportant and what is not. You can read through the question quickly and then spot the mostimportant part immediately. Are you familiar with these characteristics? Which one do you tend to use? You probably use these approaches not only in Math questions, but also in your daily life. Now, what should we do to employ all of them effectively? Remembering how you solved the question will always help you when addressing a difficult challenge. Let’s build a library of ‘Hows’ inside your brain - collect all five thinking strategies and get familiar with them! If you know a lot of ‘Hows’, you can easily adopt them to different questions and situations. The richer your library is, the quicker ideas can come to your mind. Prolific thinkers take out every approach from their library, and then pick the right one for each challenge. If you become familiar with your library, you will feel how flexible your mind can be. GMC gives you the chance to use different types of approaches to questions. 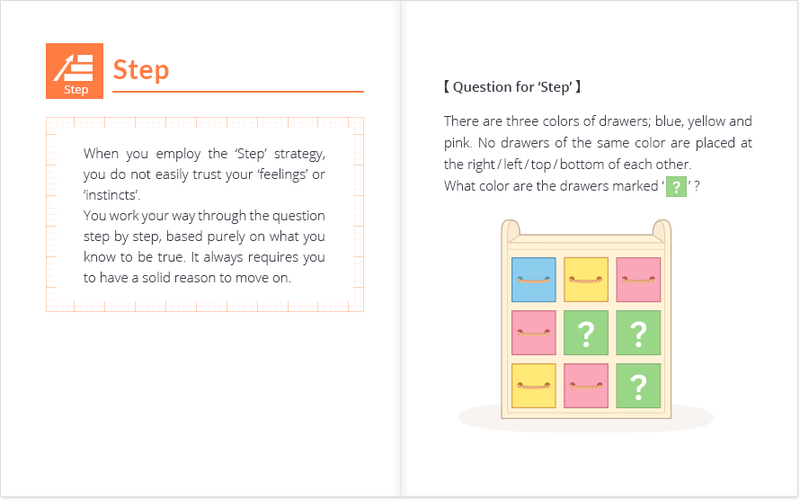 In the GMC Review, you can see which type of strategy is most effective to each question - by understanding the question solving processes, you can experience 5 different strategies, that are 5 different ways of thinking. Once you learn a new way of thinking and store it in your library, you can use it again. Savor the joy of thinking through GMC!